Grooming is a great way for pet parents to increase the bond with their special companion. It is an activity that many dog parents especially enjoy doing for their pet. Most dogs love being brushed, combed, and pampered by their human. There are thousands of products to help make the process easier. Combs and brushes are made for every coat type. Shampoos and conditioners; products to whiten the coat; potions to remove odors; all are available for professionals and average pet lovers alike. Dogs like Shih Tzu, Poodles and Maltese have long hair. 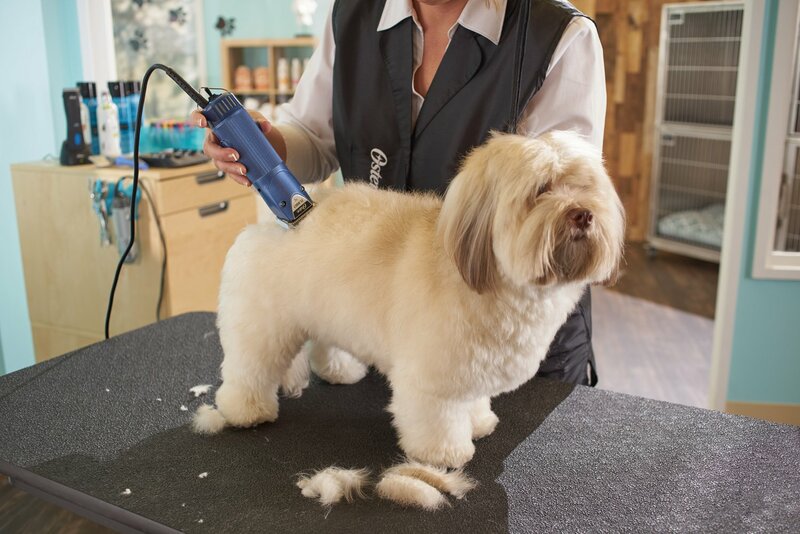 They often have thick and matted coats which require durable grooming clippers to groom them.In this article, we present our review of five of the best heavy duty dog clippers to add to your grooming toolbox. When researching the best dog clippers to purchase for use at home, you will want to keep in mind the type of coat your dog has. Tight curly fur requires a very powerful clipper with the highest strokes-per-minute to slice through all that fur for a smooth cut. The same applies to dogs with very thick coats. If you buy a clipper with a less-powerful motor, you will be disappointed and frustrated when the blades snag the fur and clog easily. Loud clippers can be very scary for timid or nervous pets. Find a clipper that features a quiet motor. Some clippers will heat up quickly during use and that can mean burns on the dog’s skin and discomfort for the user. Look for a tool that mentions being cool-running. These very popular clippers are great for new or experienced at-home groomers. Quiet and cool to the touch, the Andis ProClip Super 2Speed offers two blade speeds to make any clipping job easy for all coats and breeds. They are equipped with detachable blades for easy changes and cleaning. The 14-foot heavy-duty power cord allows easy movement around the grooming table and the shatter-proof housing is forgiving when the tool is unintentionally dropped. There is also a locking power switch to ensure the unit does not accidentally turn off. Round barrel shape for hands that need a wider grip. Compatible with all Andis UltraEdge, CeramicEdge, and ShowEdge blades. Rotating motor powerful enough to cut thick coats. PROS: Customers who have purchased these clippers have raved about their performance.You’d be amazed at how the clippers will cut the dog’s coat on the very first try. These clippers are quiet, cool, comfortable, and easy to handle. 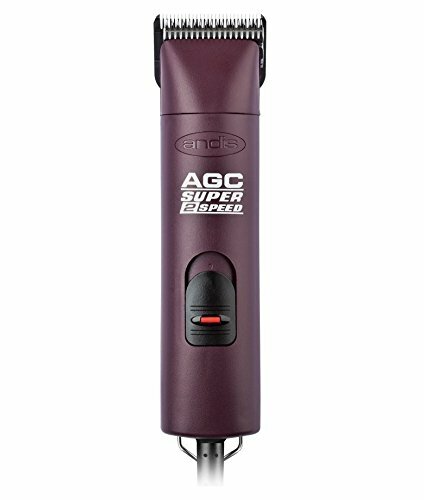 This is a heavy duty clipper and if you have multiple dogs, this will make your job much easier. CONS: The placement of the on/off switch is slightly inconvenient and may result in repeatedly turning the clippers off accidentally. 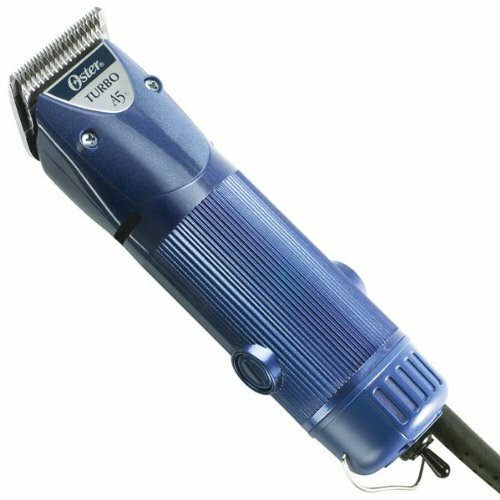 Professional groomers really like these powerful Oster A6 Cool Comfort clippers for use in their shops. Oster has combined a high efficiency, precision-tuned motor with a comfortable ergonomic design that provides hours of smooth use. With a patent pending vibration isolation system, these clippers help absorb vibration and noise, making them much more pleasant for dog and human. 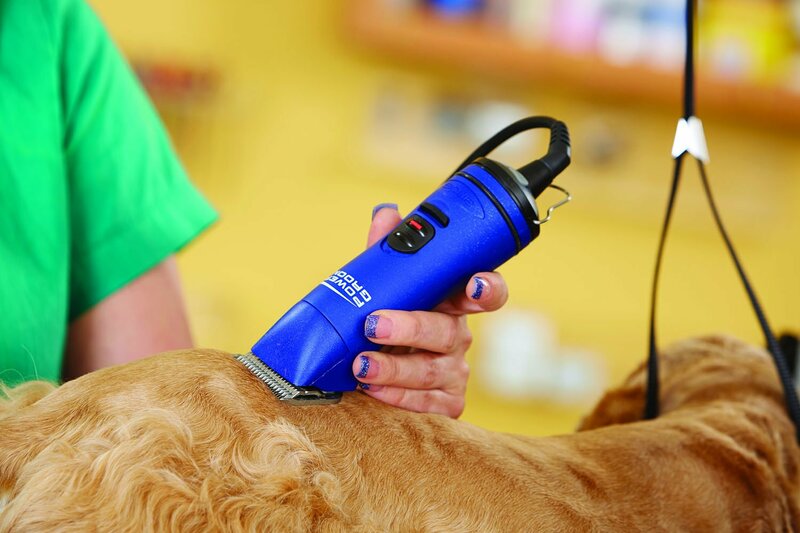 At 4,000 strokes-per-minute, grooming your dog with these clippers will be done very quickly. Three speeds with one-hand speed selection. Uses all Oster A5 detachable blades. Comes equipped with #10 blade. Specially designed 12-foot power cord that minimizes outlet space. PROS: The Oster A6 dog clippers are much lighter weight than previous Oster models. Also, they are quiet while running and feel comfortable in the hand. The clippers have enough power to cut through thick, curly, and matted hair easily. It is simple to clean, oil, and change blades. CONS: The housing of the clippers is not super durable and the plastic can break if used roughly. The improved ARCO SE cordless dog clippers from Wahl offer a no-maintenance, powerful motor with impressive cutting performance. The “5 in 1” blade adjusts to 5 popular blade sizes by the flip of a lever. They provide an 80-minute continuous run time with the rechargeable NiMH battery and will fully charge in 75 minutes on the included charging base. These Wahl dog clippers are extremely quiet, very lightweight, and feature cool-running blades and body. At 5,500 strokes-per-minute, your grooming session will be finished quickly. Clipper maintenance is easy thanks to the hard chrome blade finish which resists rust and corrosion. Comes with 2 NiMH batteries. Kit includes “5 in 1” blade technology, adjusting to sizes #9, #10, #15, #30, #40. Kit includes cordless clipper; soft storage case; 2 rechargeable NiMH batteries; battery charging base; “5 in 1” blade; 4 slide-on guide combs (#3, #6, #9, #12); cleaning brush; blade guard; blade oil; and instructions. PROS: The adjustable blade on these clippers is excellent. There is a great ease of use with the cordless operation, which will give you the ability to move with the pet. Professional groomers speak favorably about the light weight of the tool and the fast battery recharging time.You will like how powerful the clippers are and how easily they cut through thick hair. For dogs who don’t like loud, noisy clippers, these are very useful. They do not vibrate as much as many other Wahl models do. CONS: The “5 in 1” blade is not easily sharpened locally and has to be returned to Wahl for service if you want it at its best efficiency. 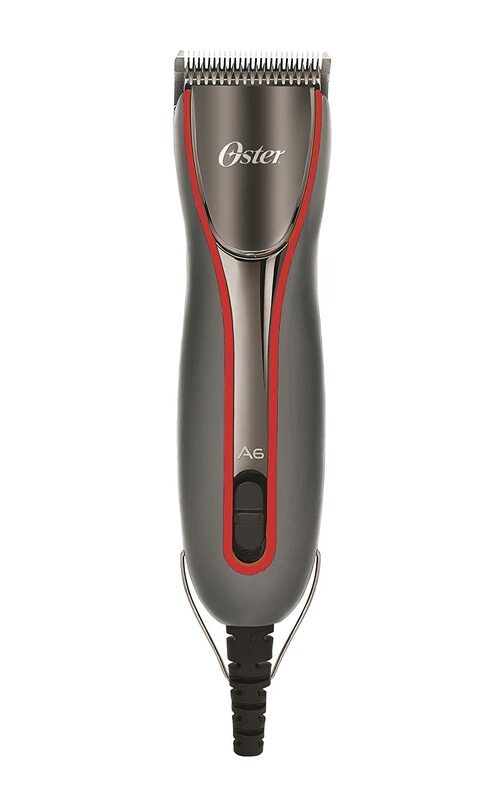 The A5 Turbo 2 Speed clipper is Oster’s most powerful tool, with a fast 4,000 strokes-per-minute on the high setting, 3,100 strokes-per-minute on low. It is appropriate for use on all dog or cat coat types and even horses, goats, and other livestock. The versatile detachable blade system allows you to change blade lengths to customize your dog’s cut. The A5 Turbo comes with a CryogenicX #10 blade which has been hardened through a special process to achieve a product stronger than the standard high-quality Oster blade. Quiet operation with a smooth glide even through thick coats. Higher strokes-per-minute and wider blade sweeps for faster clipping. Internal fan keeps clipper cool when running. PROS: The Oster A5 Turbo 2 Speed has remarkable durability o . I have personally see people who are using this model for more than 20 years and have only needed to replace the blades once or twice with regular maintenance. The clippers have kept running for the entire time.The tool stays cool while in use, even on the high setting, and operates quietly despite the powerful motor. Even on the low setting, the clippers slide right through matted hair easily. You will love how sturdy the clippers are and how good they feel in the hand while working with them. CONS: The screws holding the blades to the unit may become loose although they can be easily tightened back. 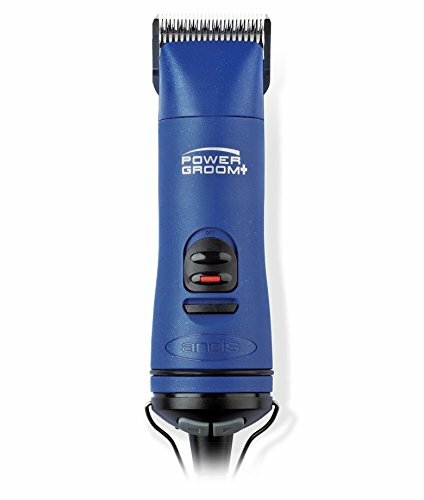 The Andis AGRV PowerGroom+ clippers could be the only fur trimming tool you will ever need. It features five adjustable speed settings for a custom trim. Thanks to the built-in memory chip, the clippers will remember your la st speed setting even after the tool has been turned off. Five speeds, from 2,500 – 5,000 strokes per minute, work on any type of coat. The blades of the AGRV PowerGroom+ detach easily for quick changes and less wasted time. This tool will fit Wahl, Oster, Master Grooming Tool, and Andis A5 detachable blades. The 360-degree tangle-free power cord is another great feature. Kit includes clippers; 4oz blade oil; extra blade drive; #10 UltraEdge blade. 5-speed settings, with touch button speed control, help reduce blade heat. Blades secured with locking blade hinge. Can also be used with the Andis Cordless Battery Pack (sold separately). PROS: These clippers are known for their power to cut through thick and matted fur. The mild vibration also creates less hand fatigue for the user. The motor is quiet and really helpful for timid dogs. The tangle-free power cord stays out of the way when working around a grooming table. Professional dog groomers reported using this tool exclusively in their shops. CONS: The clippers becomes hot during use if you don’t use the coolant/lubricant spray as recommended. We hope that our best dog hair clipper guide has helped you to select a dog grooming clipper that fits your requirements. Happy Grooming.